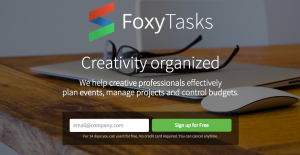 FoxyTasks is a tool that helps creative professionals effectively and efficiently plan events, manage projects, as well as control budgets. The tool allows you not only to visualize your workflow but also create milestones and assign tasks. It can also plan your events, make sure you are on the right schedule, and keep tasks or projects under budget. FoxyTasks also allows you to control the whole marketing campaign of your project’s stages. Observe the progress of your projects and oversee the results. It’s also possible to forecast your incomes with FoxyTasks. The tool enables you to track your costs and look at cash flow. Creating a cross-organizational project team is easy, too. It is also simple to control dashboards, allowing you to navigate projects from one place to another. You can sign up for free use of the tool for two weeks. In that period, you can have a glance at how the tool can keep your deadlines as well as control contractors. Thanks to the platform’s transparent process of work projects, you and your colleagues can see how your actions have an impact on the final outcome. You can also discuss with freelancers about projects or tasks by adding comments. Keep control over your project timeliness with graphic designers through reminders of upcoming deadlines and exceeded tasks. If you are launching a marketing campaign for a customer and you want to show him the status of the campaign, you can use FoxyTasks. Transparency in the project—thanks to the tool—increases commitment, confidence, and the chances of success. You can work simultaneously with your contractors and customers on documents online. In addition, you can share and present results of your actions to customers in a readable form. It’s also possible to plan new projects or tasks based on previous successful campaigns. With this tool, you can save time by using previous projects as your templates for new undertakings. You can manage tasks from many projects on one board – Kanban – and easily assign tasks to people. Project Templates, Alerts and Keeping up to date: you can create and manage tasks via email directly from your inbox. FoxyTasks will remind your team and you on deadlines, you will receive notifications and a weekly activity report on what to do and reply directly by email, you can also use past projects as templates to speed up your next similar project. Document management: you can easily share everything with the whole team and clients. Collaborate on documents in real time, upload and share files of huge sizes, and attach files by sending them through email. Collaboration With Clients and Freelancers: you can set up unlimited and free Guest Accounts for your clients or one-time freelancers. Guests won’t see sensitive details like budgets, and your clients are reminded by FoxyTasks about deadlines. Budget Management: you can plan your project budget, track your incomes and expenses on a daily basis, and monitor the health and cash flow of your projects. Last but not the least, the first project is free in FoxyTasks, no matter how long it takes. What Problems Will FoxyTasks Solve? People waste nerves on explaining others what to do, when and how – FoxyTasks will help you to be precise enough by project planning – milestones, tasks, and subtasks. You can be completely aware who does what and ensure your team members are not unproductive. You can control the whole event at every stage of your project, observe the progress, and oversee the results of your teamwork. The contact with clients is usually neglected. In FoxyTasks you can provide the feedback, event details, and schedule to all interested parties as they will also have access to the app. People usually search desperately for documents over and over again, they have no right, one place to share them with others – in FoxyTasks you can create, edit, and control all documents in one place. A lot of people keep forgetting about specific deadlines and the eventuality of exceeding the time limit – in FoxyTasks you will receive a warning info about the task which has to be immediately completed, and an alert info about all overdue tasks. The same thing with Budget, you do not have to worry about exceeding it – just plan every cost detail and let the app inform you about all costs and and incomes alterations. Since each organization has specific business needs, it is advisable for them to desist from looking for a one-size-fits-all ideal software application. Needless to say, it would be useless to try to find such a platform even among popular software platforms. The clever thing to do would be to jot down the various important aspects that require consideration such as main features, finances, skill levels of workers, company size etc. Then, you should do your homework thoroughly. Read some FoxyTasks reviews and look into each of the other systems in your shortlist in detail. Such comprehensive research can ensure you reject ill-fitting applications and choose the system that offers all the features you require for business success. How Much Does FoxyTasks Cost? We realize that when you make a decision to buy Project Management Software it’s important not only to see how experts evaluate it in their reviews, but also to find out if the real people and companies that buy it are actually satisfied with the product. That’s why we’ve created our behavior-based Customer Satisfaction Algorithm™ that gathers customer reviews, comments and FoxyTasks reviews across a wide range of social media sites. The data is then presented in an easy to digest form showing how many people had positive and negative experience with FoxyTasks. With that information at hand you should be equipped to make an informed buying decision that you won’t regret. What are FoxyTasks pricing details? What integrations are available for FoxyTasks? If you need more information about FoxyTasks or you simply have a question let us know what you need and we’ll forward your request directly to the vendor.